We’ve been long time fans of profiling tools and use them almost every day in our business. Our primary tool is the Myers Briggs Type Indicator (MBTI), but we’re always keen to learn about other tools that can be of value to our clients. We recently became accredited in Clarity 4D and want to share some of what we learned here (you can also listen to us talk about it i﻿﻿n this podcast episode). Like the MBTI, Clarity 4D is partly based on Carl Jung’s psychological preferences around the dynamics of thinking and behaviour, and the ancient ‘elements’ of fire, water, air and earth. Clarity 4D is a great introduction to profiling for teams who are new to it. The four profiles in Clarity 4D are represented by colours. As you can also see in the graphic, each profile has a preference for either introversion or extroversion and thinking or feeling. Preferences for intuition and sensing are not differentiated in Clarity 4D. As with any profiling tool, the intention isn’t to pigeon hole people or to limit them in any way, it’s simply to give a better understanding of the self and others and to provide new languages for communication. How do you see yourself? Do you see yourself more as a thinker or a feeler? More extroverted or introverted? How do others see you? In the context of leadership, understanding the impact you have on others and how others see you is going to define your level of influence and leadership. What is your hidden potential? Knowing what you know about your personality style and where your strengths that you can leverage are is valuable. This gives you insights into opportunities and tells you whether or not to focus on energies that you may not use a lot. Diversification is all about flexing your behaviour and expanding your thinking. So depending on the type of people and stakeholders you are talking to, you can match that energy, the language, the behaviour, the words and the communication style. This can be explored and coached on both at the level of the individual and at the team level. More specifically, developing your full potential over time. What habits can you develop in order to become an expression of the ‘ideal you’ you would like to be? Clarity 4D gives you a framework that you can use either alone or with others who have an understanding of it. Because your characteristics aren’t fixed or rigid, you can literally dial colours or energies up or down depending on the needs at that time. Each colour focuses on strengths so the language is very non-judgemental and gives you an opportunity to look at the world through a colour lens. 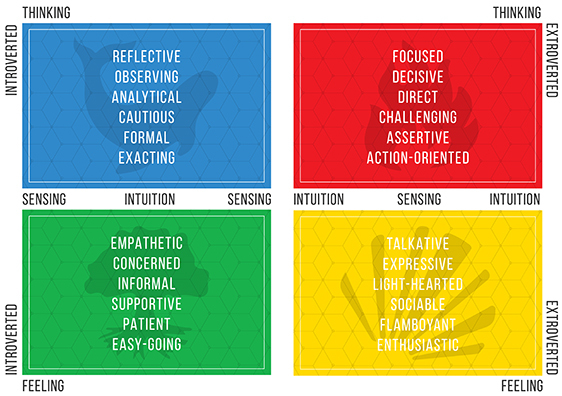 If your team is high in yellow energy - extroverted, talkative, expressive and informal - and you have to interact with a team that’s high in blue energy - reflective, cautious, analytical and formal - you can adjust your style and language to suit so your communication has more impact. We’ll share more about Clarity 4D in due course but if you’d like more information you can find the Clarity 4D site here. And if you’d like to know how Clarity 4D profiling would benefit your team, please contact us for more information. Colour your world with clarity 4d.